We've all been waiting desperately for our K-pop goddesses to return. It has been two years since we saw them as a whole, as SNSD's last album was released in August 2017. However, the members have not been idle in their music careers since then. Taeyon has been sweeping the charts with her successful solo albums. She has just released her most recent album, 'Four Seasons,' which was nominated as a first place candidate for the Inkigayo's April Music Charts for this week. Tiffany Young, Sooyoung, and Seohyun have left SM Entertainment company as of October 2017, but relieved fans by openly stating that even though their affiliations with SM Entertainment has been terminated, their career as an SNSD member prolongs. Since then, Tiffany Young set foot in the U.S and have garnered an international acclamation with her successful album, 'Lip on Lips.' She was recently awarded with the Best Solo Breakout Award for the iHeartRadio Music Awards. 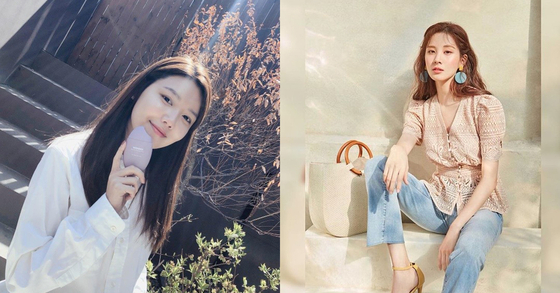 Sooyoung and Seohyun took a brief leave from the music scene to focus on their acting careers. The closest we had gotten to full SNSD for the last two years was the Oh!GG, a sub-unit group of Girls' Generation with members consisting of Taeyeon, Sunny, Hyoyeon, Yuri, and Yoona. Oh!GG proved that fans still had unwavering support and love for SNSD as their music video recently hit 1 million views on Youtube. But now, we finally have reason to believe that our beloved 8 members will return on stage as a whole. Recently, a fan has posted on Instagram Taeyeon and Seohyun visiting the SM entertainment building. Seohyun's visit to SM does have a greater significance to expectant fans since Seohyun was not often spotted in the building after the termination of her contract. Fans are hoping Seohyun's visit to SM is more than just a cordial one. Also, we have reason to believe her visit might mean just a little more. 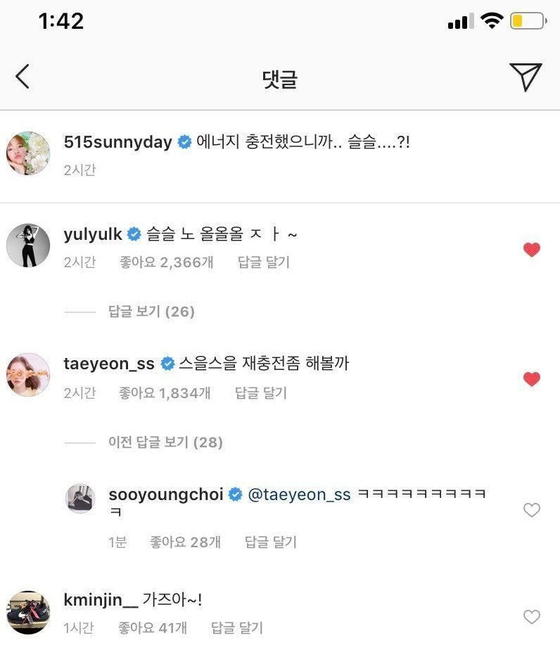 This is a conversation SNSD members had through Instagram comments. Sunny commented, "Since we had plenty of time to replenish ourselves, is it time...?" To which, Yuri replied "Maybe it's time to have fun~"
and Taeyon commented in Korean somewhere along the meaning of "Time to get ready?" Sooyoung just replied with a burst of laughter. kminjin, an SM-affiliated manager, finished the conversation with a hopeful "Let's go!" Although we can't fully determine that the members' visit and their conversation on Instagram is alluding to a comeback, it sure gives us hope for the future.